can we just take a second to marvel at that flamingo print that jeanne selected. the print is part of the animal print shop by sharon montrose, who is an amazing animal photographer. i highly recommend a visit to montrose's site to peruse her entire breadth of work. it is breathtaking. jeanne, thank you so much for sharing this mini-view and some of your favorite things with us. it has been a real pleasure having you here. thanks everyone for stopping by and happy monday! I LOVE Sharon Montrose's work, I have two of her prints in my house. Love love love! This mini view was great. Jeanne seems so sweet, and girl can rock a red lip! I'm really loving this mini-view series, Theresa. Well done! Theresa, I admire so much that you find the most interesting websites/blogs , both jeanne's and sharon's sites are great. 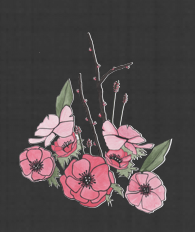 Despite jeanne's regret of not doing any formal design training, her business/blog is a perfect example of someone that naturally excels in design and creativity. Well done jeanne. Really nice mini view. She looks so friendly and I love her motto: work hard and be nice to people. PS Watched the conversation and really loved it! Love those angel wings :) gonna check out their sites when I get home, I think I've seen the animal photography one and it's stunning. Very lovely interview as usual : ). I'm heading off to her blog now! "work hard and be nice to people". i'm all in! i need to check out her site, and keep that motto in mind. thanks for sharing, t! Great mini view today T! I love her motto and I Agee that as scary as it might seem sometimes getting out there is really worth it! Yay for Mini Views! I love them. This one is no exception. Jeanne seems like an inspiring lady. 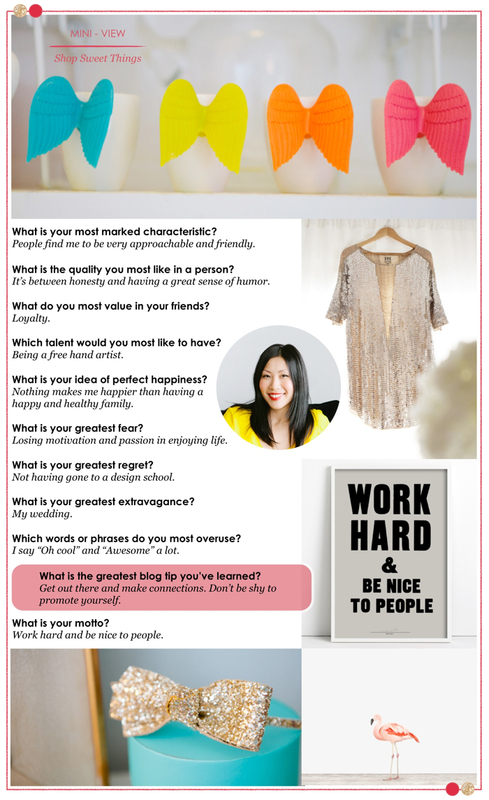 I love the haute hippie sequin dress and the "Work hard and be nice to people" print. Off to visit her space now. Thanks everyone for welcoming Jeanne here. Glad you enjoyed the Mini-View! @ERIN - You have to check out Jeanne's find for under $20. It's right up your alley and you'll love all the things she finds. I love that you have two Montrose prints. Need to get on that stat. @TINA - I love that motto also. It's so simple, yet very effective and purposeful. You're right, the blogging community never ceases to amaze me in its support. PS~Still need to watch The Conversation. I saw on Jennifer's blog that you enjoyed it. So, I'm looking forward to watching. @ANNIE - Aren't those the sweetest little cups you've ever seen? If I'm remembering correctly, I believe Jeanne got them on a trip to Venice. @CALLIE - Thank you, Cal. So glad you enjoyed. Remember: Every last Monday of the month = new Mini-View. @JEANNE - Thank YOU for agreeing to participate in the series. It was a pleasure having you here. I knew everyone would love you. @LIZ - Yes, the getting out there is definitely a wise piece of advice. I'm prone to stay in my comfort zone sometimes, but always feel much better after I step outside of it and challenge myself to meet new people or try something different. @TERI - I kept thinking about you the whole three days you were in that workshop. I haven't actually kept in touch or spoken to Max since our wedding. But, my cousin still works with him professionally, and he says much the same thing - Nicest guy with a ton of talent. @HOLLY - Isn't that sequin dress a beauty. Forgot to mention that Jeanne wore this dress for her wedding reception, so she could properly dance the night away. :) So glad you're enjoying the series. Hello my darling! I have missed you so much. I feel a tad out of the loop... hopefully I can catch up on some of the stuff I've missed out on. What a great interview T and I love that she is a BYW alumni! I hadn't visited her site until now and its fantastic! And those Sharon Montrose prints - I love them. I just pinned like 5 different ones onto my Kid's board. A little overboard yes, but they are so sweet and perfect! what a gem! such cute things. that shirt is to die for. loving this series! !